My grandfather would have been 86 this March. The world was blessed to have him for 84 years and he made a lasting impact on many around him. He certainly had a huge influence on me growing up and I learned many things through his stories. He loved to share tales of working on films, his travels and his life. My grandfather was completely dedicated to his work and his family, but his 42 years in the motion picture industry was a true testament to his love of film. He worked his way up, starting in the mail room at Disney, ending his career as VP of Advertising and Publicity at Paramount in New York City. His drive and passion is what led him to be so successful. He lived and breathed his work and truly believed he could impact the success of a film and the success of others. He certainly did throughout his career, working on 500+ movies, and he did it with great passion. Many of us push through the day, but do we truly value the impact we are making on our businesses? Are we passionate no matter what we do – whether we are selling movies, accounting and consulting services, or widgets? My grandfather realized early on that it was more about bringing people together and the engagement of the audience. For example, early in his career, he was on a trip with the Mouseketeers. They were traveling through Massachusetts and wanted to stop to watch their scheduled show. They picked out a house and rang the bell. My grandfather told the family that he wanted to bring Jimmy Dodd and the crew in to watch the show with their family. Disbelief soon led to an entire neighborhood of children and their parents coming over to this house to watch the Mousketeers with — who else? The Mousketeers! This surely had a great impact on the children involved and their love of the Disney brand. When you are passionate about what you do, the experience for others changes. The perception of your brand or company can be completely transformed through one experience. This was truly my grandfather’s motto. He loved his work and for 42 years found new ways to engage people and communities in the films he worked on, in addition to connecting with his fellow employees and team. In 1970/1971, my grandfather was working with Stanley Kubrick on Clockwork Orange. Mr. Kubrick was a very detail-oriented individual and my grandfather respected that very much. He also knew that their connection was strong and they enjoyed working together. Since they excelled in sending jokes back and forth (Mr. Kubrick was in London), he decided to send him a telegram with all of the wrong details for a screening. At that time, telegrams were the quickest method of communication – he couldn’t Tweet or post a LinkedIn update! Mr. Kubrick was not happy with this prank. My grandfather promptly let him know it was a joke and they continued to razz each other as usual for years to come. Ultimately, Mr. Kubrick was confident that my grandfather would get the job done. He never gave less than 100%. When you go to work, do you look forward to collaborating with people and making a difference at your company? Do you enjoy what you do? He did this every single day. My grandfather used to attend Oscar parties in New York and enjoyed them thoroughly. At one event, he saw Mel Brooks and his lovely wife (may she rest in peace), Anne Bancroft. Mel introduced my grandfather to his wife as “the funniest guy he knew.” This was just another way of showing appreciation for what my grandfather did for his movies. How often do we truly show appreciation for our coworkers and business partners? Saying thank you isn’t difficult and this was another way of Mel recognizing his contributions. It also made for a great story, receiving such an amazing compliment from a comedic legend. My grandfather taught me you always need a strategy, no matter what you do. Early in his career while working for Disney, Walt Disney called my grandfather and told him he was coming with Roy Disney to NY. They wanted to go to Coney Island and my grandfather would serve as their guide. Unknowingly, my twenty-something year old grandfather took these two amazing businessmen to Brooklyn. 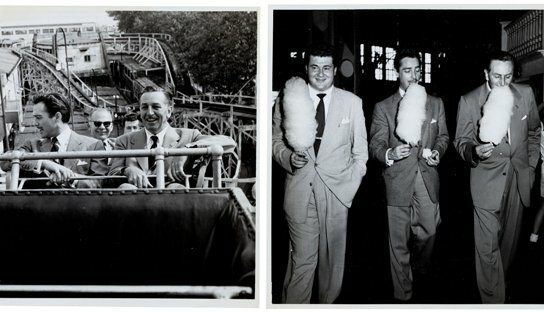 They went on rides, they watched the people, and they even had Nathan’s frankfurters! Afterwards, my grandfather asked the men why they went there. Walt replied, “to see what not to do when building Disney World.” They knew what their plans were for their amusement park, but they wanted to study the “competition” to see what pitfalls to avoid. They wanted to create something really special and unique and made sure to consider everything — including how people reacted to each ride and experience. This is one of my favorite stories and I’ve tried to incorporate this into my everyday thought process. This story is a long one, but I’ll shorten it. My grandfather, as a PR and publicity executive, would accompany many of the stars when they came to town. During one of these visits, the wickedly talented Fess Parker, who played Davy Crockett, landed at the airport. The company driver, Joe, who had picked Mr. Parker up a year earlier, brought my grandfather to get him. They greeted him and Mr. Parker immediately asked the driver how his family was — by name. “How is little Joey and Jessica and your wife, Jill?” My grandfather was stunned. Mr. Parker had only interacted with Joe for 15 minutes the previous year and cared enough to remember all of the details of his family. This story taught me the importance of truly valuing people and caring about everyone you meet. With the fast paced world we live in, you need to value and cherish the connections you make and treat each interaction with respect. It also taught me that no matter how successful you may be, you should always remember where you came from. Those roots will keep you grounded and thankful for everything good in life. These five things have helped to guide me in my career and life, and I am grateful my grandfather shared these lessons with me. I hope these concepts and stories will inspire you to go out and be passionate, love what you do, appreciate those around you, learn from others, and listen carefully – everyone has a story to tell.